Turn to a fixed-rate home equity loan, or take advantage of our Home Equity Line of Credit, when you need money for a specific project. Perfect for adding your dream kitchen, adding that patio or deck, or paying off debt. *Actual Annual Percentage Rate (APR) is based on the value of an index and may vary according to overall credit history, total account relationship and payment method. Minimum loan amount $10,000. Maximum loan-to-value is 90%. Other third party fees may apply ranging from $500 to $700. Offer begins February 1, 2018 and may end at any time. The maximum Annual Percentage Rate that can be charged is 18%. The line has a variable rate feature and the Annual Percentage Rate and the minimum monthly payment can change as a result. See full disclosures for complete conditions and restrictions. Borrow only as needed. Pay interest on the outstanding balance only. **Consult your tax advisor regarding the deductibility of mortgage interest and charges. 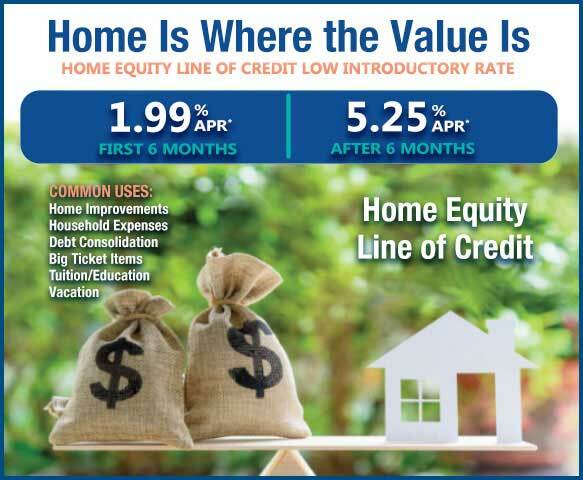 ***Home Equity Line of Credit: The Annual Percentage Rate is based on the value of an index and may vary according to overall credit history, total account relationship and payment method. The index is the highest Prime Rate published in The Wall Street Journal on the last business day of the month. To determine your Annual Percentage Rate applied to your line, we will add a margin to the value of the index. The maximum Annual Percentage Rate that can be charged is 18%. The line has a variable rate feature and the Annual Percentage Rate and the minimum monthly payment can change as a result. The rate can be adjusted monthly. You could pay certain fees to third parties to open a line. These fees generally total between $500 and $700. If you have an outstanding balance of $10,000, minimum monthly payment would be $100.00 at 1%. Minimum monthly payment amount is $75. Other terms and conditions apply based on the type of loan you establish. Conditions and restrictions may apply. Turn to a fixed-rate home equity loan when you need a set amount of money for a specific project. Home Equity Loans are perfect for adding your dream kitchen, adding that patio or deck, or paying off debt. Interest rate is fixed for the life of the loan. You’ll pay a fixed payment every month, which includes principal and interest. Market-leading rates and online application. Maximum 80% loan to value for First Lien Home Equity Loans. Rates shown for 2nd Mortgage Home Equity Loans are 80% loan to value. *Home Equity Loan: An APR of 5.50% would require a monthly payment of $6.88 per $1,000 borrowed. Payment example does not include amounts for taxes and insurance premiums; the actual payment obligation will be greater. The rate may vary depending on each individual’s credit history and underwriting factors. All Credit Union loan programs, rates, terms, and conditions are subject to change at any time without notice. Budgeting, savings, and loan calculators to help you with financial decisions.